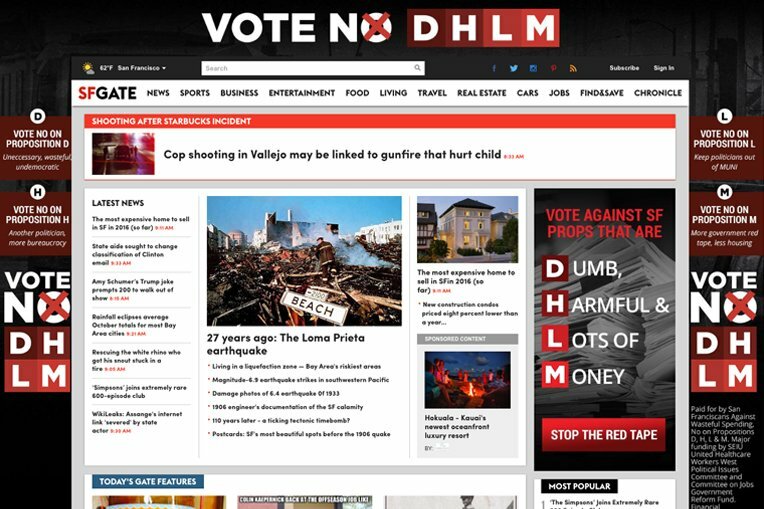 The No on DHLM campaign was formed in 2016 to persuade city residents to vote against propositions that would have unnecessarily inflated government bureaucracy, blocked affordable housing projects, and put further stress on an already-strapped public transit system. 270 was tasked with developing a campaign that would persuade San Franciscans to vote against propositions D, H, L, and M.
During the 2016 election, San Francisco residents were set to vote on several propositions that would affect their lives on issues ranging from elected local government positions to taxes and education. Contending with twenty other ballot propositions, 270 needed to design a smartly-targeted paid media program with fresh creative to cut through this crowded political media landscape. To accomplish our goals, we leveraged partnerships with local publications and used social media to reach and persuade likely voters. We know that people consume digital media across a variety of websites. We wanted to ensure voters were informed about the propositions both as a bundle and individually, so we designed a multi-platform digital paid media campaign to reach our target audience -- likely voters -- wherever they were online. 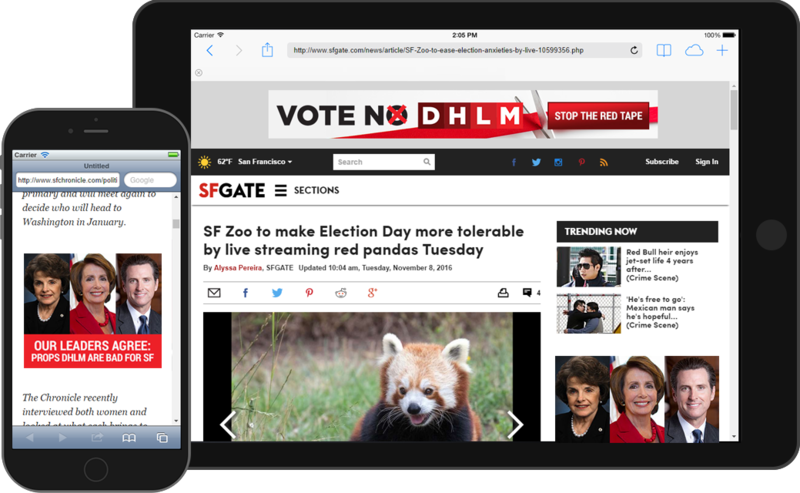 Using several ads that would persuade and inform voters about the various propositions, we partnered with the San Francisco Chronicle and SFGate.com to run digital ads in many forms, including high-impact homepage takeovers, native sponsored content, and traditional display & video ads. Additionally, we used search ads to dominate Google search results about the propositions, helping to persuade voters who were actively researching the issues. We broadened our reach with programmatic display, using voter file data to reach them whenever they showed up across the web and on social media. When the results were tallied on Election Day, none of the propositions passed, protecting San Franciscans from wasteful spending and inflated government bureaucracy. By the end of the election, we had reached San Francisco voters with 4 million impressions on 35 pieces of tested creative. The No on DHLM campaign helped to make sure that San Francisco residents voted against unnecessary city government positions and halted more red tape that would have made it harder for people to gain access to affordable housing and public transportation.